Most of this is copied from another tutorial. This mapping skips the SPI pins used by the SPI TFT screens as well as the analog audio out pins so that it may be used with those screens attached and analog audio. First of all you will need to solder the required pins to the GPIO of your Pi Zero. Here is a map of where to solder the pins. solder the ground to any of the ground pins on the GPIO. I suggest starting with a fresh image of retropie as this will use a certain set of keyboard keys that I preselected. 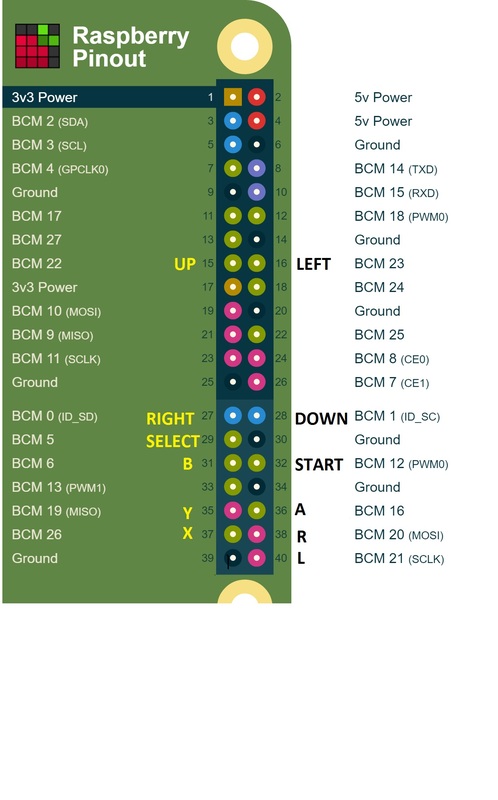 With a fresh retropie install you will be able to map these key presses on first startup. map the following table of keys with your keyboard so that things will work with my Code. Then you can get in and setup network so you can use SSH and FTP. Download the retrogame.c file at the google drive link below and place in a directory on your Pi Zero SD card. I used FTP to get to my pi zero and made the Adafruit-Retrogame directory in the /home/pi directory. This is the directory referenced later in code in this tutorial. So its best to stick to this. press F4 on a keyboard then. At this point you will need a terminal connection. I highly suggest using SSH as this will allow you to test run retrogame with the gui running on your device for button mapping testing. Here is the wiki on how to SSH into retropie. Your pi zero will need to have a network connection for this to work. This should build the executable retrogame utility. If you instead get an error message, there’s a problem in the edited table — most likely a missing curly brace, comma or semicolon. One more step is to create a custom udev rule which will allow retrogame input events to be visible to applications built using the latest SDL2 library. Some applications like the latest version of RetroPie's EmulationStation frontend require SDL2 and can't see input events from retrogame without this rule. It can't hurt to add this rule even if you aren't using EmulationStation or other SDL2 apps. Save the file by pressing Ctrl-O and pressing enter, then exit nano by pressing Ctrl-X. Restart your Raspberry Pi to make sure the new configuration is loaded. Now we’re in good shape to test it! Give it a try. If it seems to be working, press control+C to stop the program and we’ll then set up the system to launch this automatically in the background at startup. If you placed the software in a different location, this line should be changed accordingly. “sudo” isn’t necessary here because the rc.local script is already run as root. The software will now be patiently waiting in the background, ready for use with any emulators. Each emulator will have its own method for configuring keyboard input. Set them up so the keys match your controller outputs. Up/down/left/right from the arrow keys is a pretty common default among these programs, but the rest will usually require some tweaking. Last edited by prerunnerseth on Mon Jul 24, 2017 10:01 pm, edited 9 times in total. Was always curious about this. If the controller can be wired to the gpio pins why use a teensy? Retrohead95 wrote: Was always curious about this. If the controller can be wired to the gpio pins why use a teensy? A teensy makes it easier to do this, and it might eliminate any compatibility problems with the emulators. Well done man! I kinda wanna use GPIO as well at first but I went for teensy instead. how can i do it if i use l1, l2 , r1 and r2 ? mynameisbambambam wrote: how can i do it if i use l1, l2 , r1 and r2 ? There are a few more un-used GPIO pins and many more if youre not using a SPI bus display. you can modify the table in the C file i sent. Its really not hard. the program will tell you when you run it if there is a conflict. I just completed mine. Thanks for writing this up. Worked without any problems for me.